At Edgewater Pool and Spa our swimming pool and spa maintenance program in Toluca Lake, California is designed to provide you with the proper ongoing attention to detail that will keep the pool water healthy and safe for your enjoyment. We do this by keeping your water chemistry balanced to ensure it’s not too aggressive, or to saturate. Our maintenance includes scrubbing or brushing the walls and tile weekly to minimize buildup of calcium or algae before they become hard to remove. Ultimately swimming pool maintenance saves you Time, Money and gives you peace of mind that your pool is properly maintained and taken care of. In addition, regular brushing and vacuuming prevent the plaster from staining and discoloring. 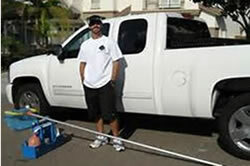 Pool maintenance in Toluca Lake, California is very important due to the Santa Ana wind conditions we face every year. Debris left at the bottom of the pool for extended times can cause stains on the plaster. Once stain set in they sometimes cannot be removed easily. Our company is absolutely committed and focused on CUSTOMER SATISFACTION. We are highly trained professionals who are dedicated to providing the most dependable, honest and affordable swimming pool and spa service available in TOLUCA LAKE. We are a team you can trust your swimming pool maintenance and cleaning too. Our pride and integrity shows in our work. Whether is an algae issue or cloudy water we have the experience to solve these problems FAST. We know that you expect your weekly pool cleaning service to be aggressive when troubles arise. The swimming pool and spa maintenance we provide in TOLUCA LAKE is intended to prevent frustration for you and maximize your family’s enjoyment of the swimming experience.